For almost forty years, the 443.2 m (1,454 ft) tall 102-storey Empire State Building was the tallest building in the world before being surpassed by the twin towers of the World Trade Center. It regained the title of New York’s tallest building after 9/11, but by this time it was only the second tallest building in America after the Sears Tower in Chicago (now the Willis Tower). The rebuilding of the Word Trade Center and the construction of 432 Park Avenue have since relegated the Empire State Building to third place in New York; worldwide the many large buildings constructed during the first two decades of the twenty-first century have pushed it down to a world ranking of 40. The Empire State Building nevertheless remains an icon: as synonymous with New York as Tower Bridge is with London or the Eiffel Tower with Paris. Completed in 1902, the 20-storey Fuller Building was one of the tallest buildings in New York at the time. The building owes its wedge shape – and hence its nickname – to its location on a triangular block formed by Fifth Avenue, Broadway, and East 22nd Street. Completed in May 1931, the 318.9 m (1,046 ft) Chrysler Building held the title of the tallest building in the world for just under a year before being surpassed by the 380 m (1,250 ft) Empire State Building. Architecturally, however, its Art Deco style makes its taller companion look plain in comparison. Although it served as the corporate headquarters of the car manufacturer until the 1950s, it was built and owned by the company’s founder, Walter Chrysler. Ownership passed to Chrysler’s family after his death in 1940, and the building was sold on in 1953. It has since changed hands on a number of occasions. Built between 1903 and 1913, Grand Central Terminal is the largest railway station in the world by number of platforms. The 19 ha (48 acres) site’s 44 platforms are all located underground on two levels, serving 41 tracks on the upper level and 26 on the lower. Its eateries and shops, as well as its distinctive architecture, have made Grand Central Terminal into a major tourist attraction as well as a railway station. In 2013, it attracted 21,900,000 non-travelling visitors. I read science fiction from an early age. Among the first works I read were a series of novels by the late Sir Patrick Moore, set on the Moon and on Mars. But much of what I read was short stories: by the age of ten I had read many of the classic short stories of Sir Arthur C. Clarke, Brian Aldiss, and Isaac Asimov. Other stories I read are less well-known, and three stories I read as a schoolboy between 1970 and 1971 remained lost to me until the internet age three decades later. One of these was Second Ending, a novella/short novel by Belfast-born British author James White, best known for his Sector General series. It was the first story he wrote, though not the first to be published. As was common at the time, it made its first appearance in magazine form, serialised in between June and July 1961 in the US publication Fantastic. In 1963, it was paired with Samuel Delany’s The Jewels of Aptor in an Ace Double paperback (F-173). An abridged version appeared in 1970 in the anthology Out of this world 8; and its sole appearance in a publication containing only work by James White was in the 1977 omnibus Monsters and Medics. It has been out of print ever since. On a Sunday morning in the summer of 1970, I was working my way through the Out of this world 8 anthology, which I had borrowed from the local library. With the characteristic short attention span of a teenager, I had first read all the shorter stories in the volume. Even abridged, Second Ending was considerably longer than anything else in the book. Second Ending is described by White as a story about the last man on Earth with an upbeat ending. If I remember correctly, this description also appeared in the anthology. Ross (whose first name we never learn) is a 22-year-old medical student who is diagnosed with an incurable form of leukaemia and placed in Deep Sleep (suspended animation) to await the discovery of a cure. He enters Deep Sleep in 2017 (then 56 years in the future) and is revived 291 years later in 2308 to find that he is the last man alive. He is five miles underground, in the lowest level of a hospital designed to survive a nuclear war (the ‘nervous tendency to build down’ followed the First Atomic War, which killed 90 percent of the world’s population). A second war has indeed occurred, killing all life on the surface. His leukaemia has been cured by a treatment that required 75 years to take effect – but in the meantime, all the human staff in the hospital including Ross’s fiancée Alice have died of old age, leaving only robots. Ross is constantly attended by 5B, a Mark 5 Ward Sister who was upgraded by a terminally-ill cyberneticist named Courtland. Taken out of Deep Sleep, Courtland selflessly agreed to spend the last months of his life modifying the robot rather than go back into hibernation. After studying Courtland’s notes, Ross has the 5B modifications extended to all the other robots and equips them with trailers containing additional memory banks. He then sets about building robots that can search for survivors on the surface. Ross forms a friendship with 5B and discusses telling lies, doing a kindness, and making puns with her. He explains that circumstances might arise in which the kindest course of action might involve telling a lie. 5B replies that it against her basic programming to give false or incomplete information. Ross spend three hours trying to explain puns, apparently without success. After two years, Ross is forced to return to Deep Sleep when his food supply runs out. He instructs to robots to produce a new food supply from grass seeds that were caught up in the turn-ups of his trousers before he entered Deep Sleep for the first time. The project is successful, but it takes 43,000 years to complete. In the meantime, the robots have made considerable technical advances with the aid of books, engineering blueprints, and pictorial data salvaged from underground installations. Despite now being intellectually far superior to Ross, 5B explains that the robots still exist only to serve humans, and without humans they will have no reason to exist. Unfortunately, they have so far failed to find any human survivors or indeed life of any kind on Earth, the Moon, or Mars. Ross’s attempts to recreate intelligent life from the grass are only partially successful. Ross becomes depressed and spends long periods in Deep Sleep while Sun heats up and the Moon spirals in towards the Earth where it breaks up after entering Roche’s Limit. Eventually Earth’s oceans boil away into space as the Sun enters a period of instability preceding a sub-nova detonation. Despite Ross’s seemingly hopeless situation, the story takes an unexpected twist leading to the promised upbeat ending (click HERE for spoiler). I wanted to read the full version, but never came across it. The title Second Ending stuck in my mind, but the name of the author did not. In 1974, now a first-year science student, I read another of James White’s books, The Dream Millennium, which also features Deep Sleep (or in this case Cold Sleep) technology. From this, I correctly guessed that White was also the author of Second Ending, though it was not until 1988 that I conformed this after reading his entry in The Encyclopaedia of Science Fiction (again borrowed from a local library). I then tried to buy Second Ending from the Science Fiction Bookshop in London. At that time, much of White’s oeuvre was still in print, but – as I now know – Second Ending was not. It was a further twelve years before the quest came to an end. In the first weeks of 2000, by now possessing a laptop and dialup internet access, I learned the publication history of Second Ending, and was able to source a 38-year-old copy of the Ace Double paperback. The story hasn’t aged particularly well: the premise that Earth could be sterilised down to microbial level by a nuclear war seems implausible; White’s description of the war predates the discovery that it would trigger a ‘nuclear winter’; and his description of the long-term fates of the Moon and the Sun are now known to be inaccurate. There are numerous editing errors: for example, the earlier nuclear war is said to have occurred fifty years before Ross was born: he enters Deep Sleep in 2017 aged 22, which would put the war in 1945 (possibly an early draft of the story referenced the use of nuclear weapons at the end of WWII rather than a new conflict). Ross recalls working on the hospital’s 31st Level when he awakens, but we later learn that the hospital has only five levels. Courtland, the inventor of the 5B modification, suddenly has his name changed to Courtney. Its limitations notwithstanding, Second Ending was shortlisted for a Hugo Award in 1962, but it had the misfortune to be up against Robert Heinlein’s magnum opus Stranger in a Strange Land. James White went on to be an acclaimed science fiction author, but he was never able to make enough from his writing to give up his day job at the aircraft company Short Brothers. He died in 1999 aged 71. I don’t normally respond to critical reviews of my book on Amazon, which tend to be ill-informed, poorly expressed, and of questionable relevance (for example, two stars because there was no reference to Jesus). Marcus’ review is none of these things. He gives no details of his background, but he is clearly well read and highly knowledgeable on the subject. His review is one of the most detailed I have seen. Please read Marcus’s Amazon review here (as I obviously am not able to reproduce it on this site). Marcus begins by noting that around a hundred years ago, it was common to publish books that were ‘grandiose’ in their titles and scope, purporting to cover subjects such as world history in their entirety. He suggests, not entirely incorrectly, that I have attempted something similar. His main criticism is that my book “…has no point of view and no goal, except to be fair and comprehensive…” unlike the works of Jared Diamond and Yuval Noah Harari. But that is hardly a valid criticism because to be fair and comprehensive is exactly what I set out to do. I never set out to put forward an overarching point of view. 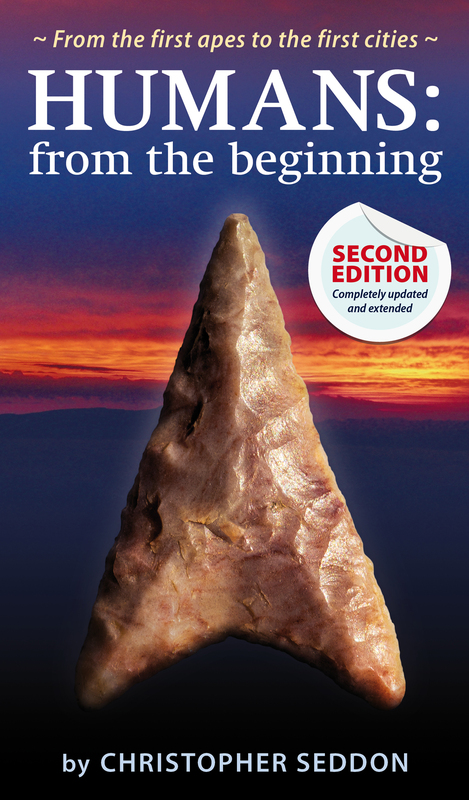 I have read many of Jared Diamond’s books, and share many of his views, but I felt that the book that I was attempting would not be a suitable platform for them. Marcus is the first person to comment on the last chapter of my book, entitled Humans: the future. This is exactly what I intended it to be: a more-or-less standalone essay about humanity’s future as a counterweight to the rest of the book. As Marcus correctly observes, it is certainly not a summary of the rest of the book; but it was never intended to be. However, to Marcus, it sums up the ‘problems’ of the book. I think the main ‘problem’ is summed up by Marcus when he says “Personally I prefer a book that wears its heart on its sleeve.” In other words, what he sees as a ‘problem’ is nothing more than his personal preference. He is, of course, fully entitled to his preferences, but he should not confuse a book that does not meet these preferences with a lack of quality on the part of the author. Marcus does make some good points. In the last section of the book, I swallow the early civilisations of ancient Mesopotamia and Egypt into a single chapter, but I devote three chapters to the pre-Columbian civilisations of the New World (though not to the Aztec or Inca, which I mention only in passing). The rationale was that I was writing about places and times before the advent of written records, and writing was far less prominent in the New World. The same criticism has been made by others, and in the upcoming second edition of my book, I have considerably expanded my coverage of the early civilisations of the Old World. Marcus also notes my support for Colin Renfrew’s Anatolian hypothesis about the spread of Indo-European languages, which he describes as ‘rather unfashionable’. Here I will note that my book was published in 2014, shortly before ancient DNA studies provided clear support for the rival Steppe hypothesis. I was indeed a strong proponent of Renfew’s elegant hypothesis for many years, but I will admit that the Steppe hypothesis now seems very likely to be the correct model. The forthcoming second edition of my book reflects this new evidence and my changed position. Marcus does make some claims about my book that I would strongly dispute. In particular, he states that “…the bibliography is rather heavy on generalist popular books and rather light on academic works…” This is completely false – out of around 1,200 references cited, there are no more than a few dozen populist works. The vast majority of the citations are peer-reviewed journal articles. He also claims that I am “...very dismissive of any idea that non-sapiens humans had any culture, which is another example of his lack of even-handedness.” I am not sure how he comes to this conclusion, as this is certainly not the view I take. Nor do I dismiss astronomical alignments, as he suggests. There is a difference between healthy scepticism and outright dismissal. Finally, Dyson spheres are not “weird ideas from science fiction” but a serious proposal put forward by the highly respected physicist and mathematician Freeman Dyson in 1960 in the journal Science. In conclusion, Marcus questions whether such ‘grandiose’ books as mine have a place in the twenty-first century. His view (albeit containing a few editing errors) is that you will get more out of reading works that are narrower in scope and less even handed. While such works are evidently more to his personal taste, they are not what I set out to write, and there is surely a place for both.